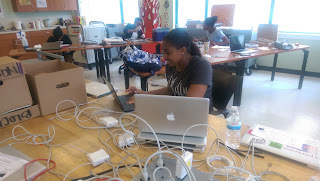 For the past three years SLA (SLA refers to both campuses of Science Leadership Academy, SLA Center City and SLA Beeber) has been running a summer program called SLA's Summer Technology Program. This program is in partnership with the Ellis Trust, The Charles E. Ellis Trust for Girls (The Ellis Trust) helps eligible young women in Philadelphia excel in high school and be prepared for postsecondary success. This program not only empowers our students to be technicians that can fix all parts physical and software related to our one to one laptop program; they are also empowered as ambassadors of our school and the "SLA way". The girls participate in and help manage the events that take place at the center city location all summer long. The program starts the weekend after the fourth of July and lasts until the last day of August. During this time SLA hosts a Summer Teacher Institute and a student Summer Institute. The summer also holds tours for perspective students, interviews for perspective transfer and new ninth grade students and phone conferences with principals from both campuses. The tradition, for the Ellis Trust, back when they had a brick and mortar school was to graduate each girl with a sewing machine. From the onset of the Summer Technology Program SLA's tradition has been to reward each girl with a laptop and printer for her service to the school. This tradition started with Diana Laufenberg for a graduate in 2013. The SLA Summer Technology Program was started by Rafaela Torres, Chris Lehmann and Marcie Hull. The program has continued with the help of Mary Beth Hertz, Adrienne Williams, Jeremy Spry and Chris Johnson. In the next weeks I plan to showcase all of the girls currently working for the SLA Summer Technology Probram. If the internet has any questions for them, I will be happy to include them in my interview. I plan to ask them about their experience and have them reflect on personal gains of having an experience like this one.